Nerine Constantia Desmond Fial was born in Constantia, Cape, 1908. She studied graphics at London's Central School of Art in 1938, but was otherwise largely self-taught. The commemoration of the Great Trek occurred in 1938, and she explored Voortrekker themes at this time, more concerned with themes of hardship and suffering than expressing any nationalist sentiments. Rosa Hope also did the same. Both artists entered works on this theme on the Eighth Annual Exhibition of Contemporary Art at the SANG in 1938-1939. Evening Prayers is representative of this theme in Desmond's work. Her association with SASA was not consistent, as she often exhibited independently. Pagel's Circus, which is undated, is most likely from the 1940s, when this circus, owned by William Pagel, was a familiar sight in SA. 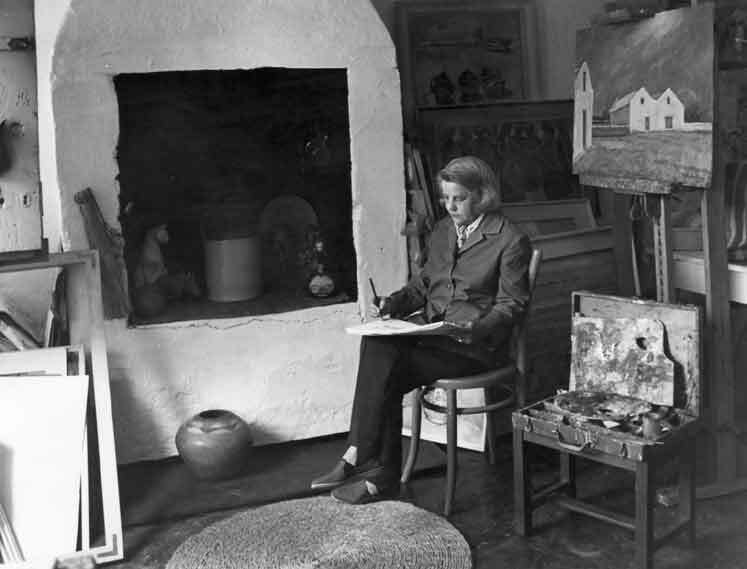 In 1949 she painted extensively in Namibia and in 1954 did the same along the east coast of Africa. Although also a member of the New Group, she seems to have actively exhibited on SASA exhibitions in the early 1940s, despite their rivalry. Exhibitor on SASA-related exhibitions c.1898 - 1950: 1936: SASA sect., with NA & jndep. artists, 6th Annual Exh. of Contemp. Art, SANG, 17 Dec - 17 Feb. 1937. 1938: SASA sect., with NA, 8th Annual Exh. of Contemp. Art, SANG, 15 Dec - 15 Feb.1939. 1940: SASA 37th Annual Exh., AG, Burg St., 29 Jan - 10 Feb. 1941: SASA 38th Annual Exh., SANG, 17 Feb.-31 Mar. 1942: SASA 39th Annual Exh., SANG, 23 Feb. - 18 Apr. 1942: SASA Winter Exh. (venue not stated) 14 - 29 Aug. 1943: SASA 40th Annual Exh., (in comb. with NSA) SANG, 1 Feb. 1944: 41st Annual Exh. of SA Contemp. Art, org. by SASA with other Societies, SANG, 25 Feb.